boogaj: I need to buy a vowel because. . .
Its a fabulous book, isn't it. I bought it last year but haven't actually made anything from it. Hard to choose where to begin! Enjoy it. I'm glad you like the book b/c I have it and think the patterns are lovely. 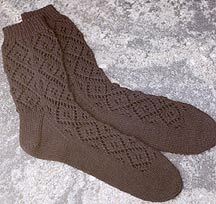 There are a few shawl patterns and the socks on my to-do soon list. There just isn't enough time to get it all done. 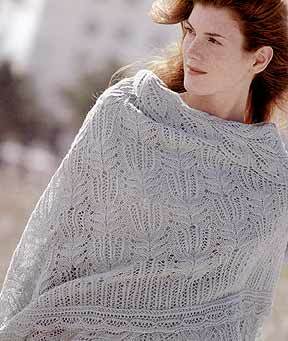 LOVE the spiral shawl, can't wait to see it if you knit it. I love the book too and knit a shawl from the patterns immediately -- the spiral shawl. Here's pics. Wow -- thanks for the great reveiw of the book! It's on my some-day once I've made a few more lace things list. Yes, yes, I love the Vanalinn gloves! It was an easy pattern and they are so elegant. I should buy some more yarn to make a second pair. I did them in bright red but would love some in black or dark purple. There really are some lovely patterns in that book--I also love that spiral shawl, and just in general love that frost flowers lace. I did think that there were a couple things that were kind of ugly, though--towards the back (though I can't remember specifics). And--just as a formatting complaint--I had a hard time telling where one pattern ended and the next began--I didn't like the way they headed each pattern page . . . but that's just a minor little thing, and doesn't really take away from the beauty of most of the patterns. I'm really glad I got a copy! I'll have to browse through it sometime. I've been dieing to find some great lace patterns. That spiral is beautiful and the frost and flowers...divine. Why do these things happen. I know the book is out there, but I have purposely not looked at it. Now I just have to get it:) Thanks for the sneak peek. I thought it was all shawls. I think I need to make those gloves as well. I think they would look really delicate without finger tips too. Oh lace...it really is a summer of lace, huh? the designes are really pretty. Ooooo, that Frost & Flowers shawl must be mine! I didn't know the book was out in paperback. Thanks for the enabling, umm, notice. Thanks for the review! A lot of the knitting books aren't released in Australia, so we have to order them sight unseen. I've had this on my wishlist for a while, but wasn't sure because I couldn't really see it. 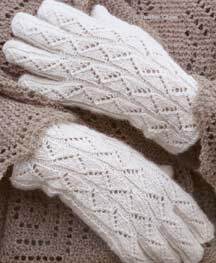 I've been looking for a lacy glove pattern, and that one looks great! And the shawls are gorgeous! Thank you for enabling me. I will buy this book. if anything, just so i can knit those gloves! I've had my eye on that book since I discovered how attainable lace knitting was. Thanks for sharing the photos--I love that pinwheel shawl! I love that book and have many of the projects on my to-do list. I think the paperback version has corrected much of the erratta, but possibly not all. Best to check.